Use this 8 qt. 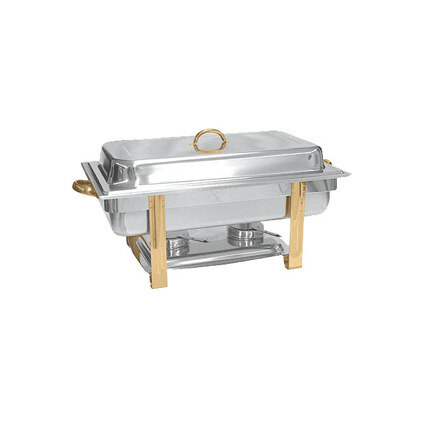 full size gold accent chafer to create a beautiful buffet setting! This rectangular chafer is made of durable stainless steel, with a mirror-polish finish and attractive gold accent legs and handles. The half-circle handle on the top of the lid also allows for easy and safe access to the food. Prop the lid back and let it rest on the two cover holder clips for convenient hands-free use. Two side handles on the chafer's frame enables easy and steady transportation. Meanwhile, four broad legs ensure optimum stability and showcase the elegant gold detailing.